When looking for the best fingerprinting places in Nevada, you have a number of options. But not all fingerprint and background check facilities are the same. So how do you find the most reputable vendor who will treat you or your employees with respect, keep your personal information safe, and provide services in a timely, professional manner? Get to know what Fingerprinting Express is all about with these thirteen facts that you probably didn’t know. 1. We have been in business since 2003 when Becky Riersgard founded Fingerprinting Express after going to a local police station in 2002 to be fingerprinted for a job and waiting over two hours! She realized that there had to be a more effective way to have fingerprinting done and the idea for Fingerprinting Express was conceived. With hard work and help from her daughter, Monica Pappas, what started in a small store on the second floor of a Reno shopping mall quickly grew. In 2012, Monica and her husband Dave took over ownership of the business and continued to grow it with the same values that Becky had emphasized—excellent customer service, one-stop shopping with expanded services, and highly trained staff. You can read more about the Fingerprinting Express story here. 2. Our first store opened in Reno, Nevada in 2003. 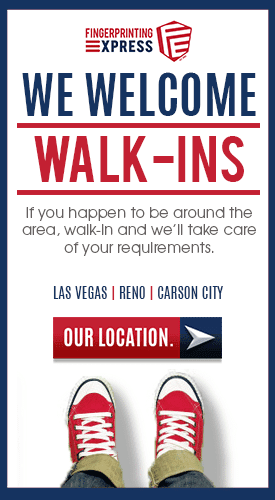 In 2015, we opened a Carson City location, followed by two Las Vegas locations in 2017 and 2018. 3. Fingerprinting Express has discounted over $60K in fingerprinting fees for Teachers, Volunteers, Non Profits and Active Military since 2016 through our Culture to Care™ Program. 4. Fingerprinting Express is a Woman-Owned Business Enterprise (WBE) and Family Owned and Operated Business. The business was founded by Rebecca “Becky” Riersgard and is now owned by her daughter Monica Pappas with consulting and management from Monica’s husband, Dave Pappas. 5. We are the only fingerprinting brand in the entire state of Nevada that offer Civil Name Check services. 6. The average person spends less than ten minutes in one of our stores. We respect your time and work hard to provide fast services with the help of highly-trained staff and the latest technology. 7. Fingerprinting Express always has a Notary Public in the store so you can stop in any time with or without an appointment (even during lunch). Not only are our Notaries certified by the state of Nevada (required for any Notary), they are also members of the National Notary Association and are up-to-date on all necessary training. We even offer mobile Notary services for your convenience. 8. All Fingerprinting Express locations provide Free Kids Identity Kits, including fingerprints, as a way to give back to the community and promote child safety. No purchase necessary! 9. In 2018, Fingerprinting Express opened a new store right next to University of Nevada, Las Vegas (on the North/East corner of Maryland Parkway and E. Flamingo Rd). 10. We partner with individuals and large organizations by offering companies, organizations, and casinos reliable fingerprint and background check solutions to make the hiring process easier. Our reliable services and quick turnaround time, along with the value we place on exceptional customer service and privacy, make us the perfect partner for employers looking for affordable background checks and fingerprinting services for employees and volunteers. 11. Fingerprinting Express offers mobile fingerprinting and mobile Notary Public services. We can come to your home or business and will need just access to a power outlet. We request that you schedule two weeks in advance (if possible). 13. We offer guaranteed fingerprinting for licensing and employment purposes. Our high resolution, leading-edge technology and skilled staff help us ensure that we get the best fingerprints the first time, even if we have to use several techniques to help your fingerprint ridge details stand out more. Our rejection rate is less than 0.002% (industry standard is 1%). But there are many reasons why fingerprints wear down and become smooth, and this can lead to a rejection for a small part of the population. Sometimes this is a temporary condition and fingerprint ridge details can come back. In the unlikely event of rejection, just bring in your receipt and rejection letter and we will be happy to take your fingerprints again. Through our Culture to Care™ philosophy, we believe that nothing touches people more than selfless acts of kindness, which is an approach we take with our customers and within our communities. Our staff are dedicated to practicing these values with patience, genuine concern, respect, and, of course, doing our jobs right the first time while respecting each customer’s privacy and securely handling all personal information. If you have questions about any of our services, please don’t hesitate to give us a call at 800-919-0227. Fingerprinting Express is dedicated to providing exceptional fingerprinting, background check, notary, and other services to individuals and employers in Nevada. Contact us for more information on any services we offer, schedule an appointment, or walk right into one of our four friendly locations.